Is your cannabis business having trouble deciding what to share? These 45 social media post ideas will help you out! If you aren’t familiar with it, using social media to grow your cannabis business, generate leads, and position your brand the way you want it to be seen may very well seem like a daunting task. In some ways, you’re totally right. Fortunately, there are some things you can do to significantly improve the chances of your brand seeing social media success. Which, of course, means you need to know all about what social media has to offer cannabis brands. 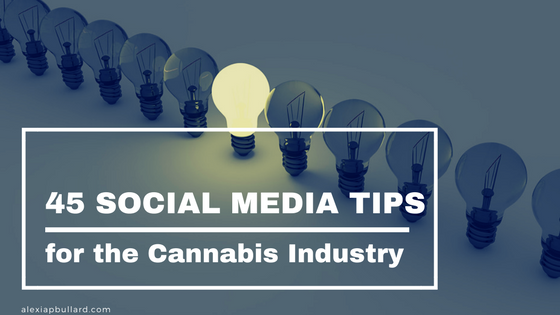 You probably already know that you should be posting information about your cannabis products on social. However, very few cannabis business let their customers see what goes into the running of your business. What is it like to be on the other side of the counter in your dispensary? What does your grow look like? You can show this easily through videos on Snapchat, Instagram, Facebook, and even YouTube. Testimonials are powerful social proof, but they also make for effective content for cannabis businesses to share on their social media. But, finding testimonials that can fit into just one single Tweet or other short social media post can be difficult. Try creating a branded hashtag that is used solely for the purpose of sharing testimonials and encouraging customers to share their own. Then, you can share your customers’ feedback and thoughts directly with your audience. One of the best ways to increase sales really quickly with social media is to announce a quick sale of clearance items directly on platforms like Twitter, Snapchat, or Instagram. Showcase the product, it’s main info, and the sales price. Include a countdown for the length of the sale, adding a sense of urgency and exclusivity (followers only) that will make your followers want to act quickly, or risk missing the sale. Birthdays are great. People love celebrating birthdays, even when it’s not their own. Leverage this on social media by making a huge deal about your cannabis business’ birthday or even the birthdays of your budtenders or crew members. If you don’t already know, Pinterest can be one of the most effective means of distributing and sharing content. It’s also an effective way to engage with your audience, thanks to group boards. Start a board where customers can share images of your products, posts related to cannabis, and (of course) your own content. Creating a literal sense of community is something that will translate well to offline, boosting in-store sales. Make sure your budtenders add to it as well, so they can respond when a customer references something they saw on your Pinterest. 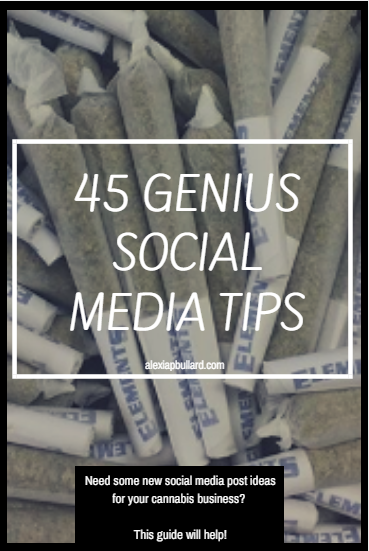 Have your budtenders or other team members choose a couple of their favorite products or glass pieces to share on social media. You can offer discounts and promote those products. To go even further, on each budtender’s birthday, offer a special sale on their ultimate favorite cannabis product from your store. 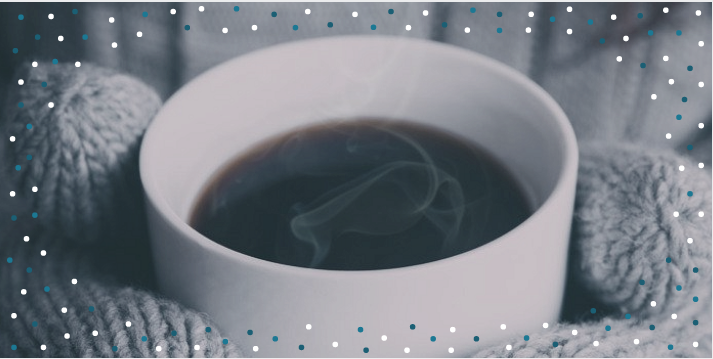 For example, you could create a coffee and cannabis pairing guide with your store’s inventory. Create a coffee and cannabis pairing guide with your store’s inventory. Easy-to-use music streaming services (like Spotify and Pandora) allow you to create playlists that can be easily shared on social media. Show your brand has a fun side by creating playlists for specific occasions or situations related to cannabis, and then share those playlists with your audience. By teaming up with other businesses for a social media campaign, you can actually increase the reach of many of your posts. Try highlighting your product being used with another company’s products. Both of you can then share it on your respective social media platforms. This can be especially effective for tutorial posts like pot brownie recipes or rolling the perfect blunt. If the same two people are always running your social media accounts each day, then your content can start to get repetitive. Switch things up by having a different team member take over your accounts every now and then, to add a bit of a different perspective to your social branding. While on Instagram, your dispensary has an invaluable, huge opportunity to reach out to a totally new audience and existing customers directly through the platform’s messaging feature. Use Instagram direct messages to distribute exclusive, limited offers to your most loyal customers or followers. Don’t use this feature that often, but once in a great while will likely help improve your brand awareness, brand reach, and either in-store or website visitors. But, that’s not all you can do with Instagram . . .
Short, stop-motion videos are a great way to highlight some of your products and vendors. You can also use the stop-motion videos to tell quick stories about your dispensary in a creative and fun way. Not all of the content your dispensary brand shares on social media has to come directly from you and your team. Regularly ask your customers to share photos of them using your products, wearing your branded merch, or doing anything else related to the cannabis industry. Share the best submissions on your Instagram, making sure to tag your customer or follower. Throwback Thursday, also written as #tbt, is a weekly hashtag on social media that involves people posting older “throwback” photos. Get your dispensary participating by sharing some old photos on Thursdays of each week. The options for this social media post idea are virtually endless. You could share funny pictures you and your team come up with, and have your followers caption it. Or, share a photo of your store staff or something related to stoner pop culture and invite your followers to suggest captions. At the end of the contest, share the best ones on your social media profile. When it comes to social media, your content and marketing don’t always have to be directly about your dispensary. You can also highlight the vendors you’ve partnered with to nurture that relationship further, increase your social reach through those vendor connections, and showcase the products in your store. World of Weed highlights their vendors in brand blog posts and product posts. Each week, give a behind-the-scenes glimpse into your business by honoring an Employee of the Week. Share a bit about your best budtenders, either directly on social media or in a blog post that you can then share on your social media channels. In addition to highlighting vendors and employees, you can also share behind-the-scenes views of your dispensary through regular pictures throughout the day. Don’t do this too often, though. A few times each year, designate a day during which you share one picture every hour, or just a few times per day. This gives people a realistic, peek-behind-the-counter view of what goes on over on the other side of the counter during any given day. Other than just telling people about your products, your dispensary can use social media to give your customers and social media followers some fun ideas for how to use the products. Create and share brief tutorials that highlight some of those interesting and unique tips, tricks, and ideas. To inject some humor into your dispensary’s social media content, you may want to consider creating a silly music video for your store, highlighting different products, vendors, deals, and budtenders. Make it funny, and you’ll be more likely to increase your shares and entertain your followers, customers, and potential customers. Boomerang is an app on Instagram that makes it easy for people to create sped up gif-esque videos. They are only a few seconds, so you can’t get in a narrative or a tutorial. You can, however, use them to show movement, such as demonstrating the basics of using those highlighted products. The majority of your social media followers are going to be more inclined to also follow brands that are at least loosely related to the cannabis industry. You can grow your brand by adding unique value for your customers by giving shout-outs to other brands your social media followers would find relevant, of interest, and useful. On most social media platforms, your cannabis brand will have a way to add GIF images to your content. By injecting personality and animation into your posts, you grab attention and show your followers what makes your cannabis brand stand out. If your cannabis business / dispensary has an official mascot, employee pet, office decoration (such as one of those raven Halloween decorations), or even your logo, you can use that as a recurring idea in your social media posts. Your followers and customers will become used to seeing and engaging with it, which drives website traffic, follower count, and sales. It might sound like a totally ridiculous idea, but memes get shared A L L the time. Which means they give you can opportunity to entertain your social media followers, while still subtly promoting your cannabis business. Take it one step further by hosting a meme caption contest and sharing the winner with your audience. Invite social media followers to send in questions through a contact form on your website, or on the more entertaining social media platforms like Snapchat. Followers can send in a Snap with a question, which you can then answer in quick videos or clips. Another way to drive engagement with your targeted audience is to ask some fun (and not too difficult!) trivia questions about your cannabis business specifically, or the cannabis industry as a whole. To really shake things up, you could offer a small prize to the followers that correctly answer the questions. This could be something simple like a couple of pre-rolls or a grinder, or it could be something big like a glass piece. Stand out from the rest of the cannabis brands out there by creating your own weekly theme for social media posts, such as #tbt. Do some brainstorming, and create something that is relevant to your brand and the cannabis industry, and keep doing it each week. Encouraging your audience to send in content and participate in your weekly series is a great way to drive engagement and website traffic. Themed content is one of the more popular social media post ideas - - And your audience will love it! 28 | Who are your customers? Interviews make for great content, and customers love reading about the experiences of others who are purchasing and using your products. You can use brief interviews to build and nurture customer-brand relationships and increase website traffic. Holiday promotions are not only standard, but they’re also essential. When it comes to driving traffic to your cannabis business website from social media, holiday promotions are a must-have. This includes 4/20, National Grilled Cheese Day, and other silly holidays that make for some edutainment content - - Something that is proven to drive conversions. For example, check out this Twitter post I recently did for National Pets Day. I tied the silly holiday into something cannabis related. This way, it’s relevant, helpful, educational, and entertaining. You can read the article about CBD for pets right here. Sure, it’s great to post things on social media that relate to your business. However, it would behoove you to post things that are totally unrelated every now and then. Share things like food recommendations for when the munchies hit, or stoner movies and books that would interest your target audience. Engaging your audience on topics unrelated to your cannabis business add a personal feel, and remind people there’s a person behind the brand. It’s also a fantastic way to create that sense of community you’re looking for with customer retention and brand growth. Recommending new things creates discussion and can really help generate conversions. Once a week or month, create a list of the latest trends in the cannabis industry that are relevant to your target audience and social media followers. Tag any related or mentioned accounts as a way of expanding your audience, your brand reach, and your cannabis business network. Facebook Live, Instagram Live, Google+, and Periscope all make it possible to hang out with your social media followers by broadcasting live video. Alternatively, you can host Twitter chats to stimulate conversation, create a sense of community among your followers, and generate engagement. Announce a weekly or monthly hangout with (and for) your existing and target audience. Stick to a regular schedule to make it easier for your followers to plan around your chat or broadcasting. Try posting some sneak peeks of new inventory or vendor days, where you only give a partial view of it to your audience. Have customers guess what they think the product is - - something that will boost engagement and get your audience talking to you and to one another. Tip #33: Give your audience sneak peeks as a way to build excitement and anticipation. Customers love businesses that are socially conscious - - especially when it comes to cannabis businesses. So, turn to social media as a means of spreading the word about the important causes and / or charities you support. Write a brief, but compelling, introduction for your most popular blog post. Explain why your website visitors read and share that post the most. Link to it, and ask them to leave a comment (give a prompt) on the post if they also liked it. Your social media followers will respond better to your brand when they know there’s a real-life person behind the brand. A person who has the very same struggles they do. Images, especially memes, are hugely popular on social media. Share images that tell stories about your brand, products, or in-store life. Share funny comic strips and memes about cannabis as a way to get your customers laughing and sharing your content. This is an effective way of building the consumer-brand relationships that sell products. Whenever you host or attend events for your cannabis business, or there’s a televised version you’re watching, share it with your followers! You can tweet or post updates and commentary through the whole event, growing your audience and improving engagement with your social media followers. Grow your network by recommending other brands and individuals within the cannabis industry to your followers on social media. Simply share a link to the other brand’s social media profile - - or just tag the profile - - and encourage your audience to follow them. Don’t worry, it’s only for 24 hours! Roughly 99.99% of the time, influencers are going to be social media users that have an engaged following and hold influence in a particular industry. Now, I did say engaged following, rather than a huge following. It’s always better to have 100 followers that are actively engaged, than it is to have 1,000 followers that are barely engaged. The former is helpful and valuable, while the latter isn’t really something that will help grow your brand. Find influencers that with your cannabis business, and have them take over your social media account for a day to add some fresh content and increase your brand reach. If your customers hang out on Pinterest (Psst! If your audience consists of educated females with high incomes, they likely are), share one of your more popular (and relevant) Pinterest boards via Facebook or Twitter. Share a related image on Instagram, and then link back to your Pinterest profiles. Connecting your platforms creates a larger audience, promotes engagement, invokes a sense of community, and broadens your cannabis business brand reach. Is your cannabis business hiring? Post your latest job openings on social media as a way of putting them in front of the most relevant candidates you will find. They already know your business and its brand, they’re familiar with your products and content, and they know what your target audience wants because they already are your target audience. If your cannabis business is active on LinkedIn, you would also benefit from distributing the list of openings among that audience as well. They’re already actively seeking employment. Ask ridiculous, humorous questions of your audience. Give them a couple of choices only, making it easy for people to respond. It could also spark friendly discussion and / or debate, just as it could make people laugh and / or promote your store’s products. For example, you could ask: Would you rather smoke ground weed that was picked up with a vacuum cleaner and sock, with a cat in the house OR Smoke a blunt your friend slobbered all over when rolling? The questions can be serious, or they can be downright funny. This works best when it’s done for fun, and generates engagement with your audience as it establishes a sense of community your social media followers. You’ve given them a glimpse behind the curtain already. Now, the spotlight is entirely on you. Give them a recap of a typical day in the life of a dispensary owner, cannabis producer, etc. Finally, show your audience you care about them by asking for their input and implementing it when creating social media content. Try asking your audience if there is anything specific they want to see or see more of. Keep your content fresh and interesting by using some audience feedback. What do you think are the most effective social media posts? What should cannabis brands share on social media? Share your ideas down in the comments!